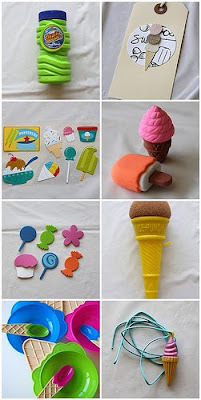 WhiMSy love: Ice Cream Birthday Party! The theme of ice cream cones & Summer fun became the celebratory force behind Pazely's 6th birthday party! I used this Martha Stewart punch, which I, luckily, got on clearance at Michael's! Some more punching was involved for some garlands I made. I splurged & purchased this 2" Fiskars punch. It's awesome! You squeeze it with one hand. Hardly any work & no ache in your hands from any pushing. I made 5 garlands, all on a different colored string I purchased from JoAnne's. The garlands, each 5 yards, had 15 of these circular paper "ornaments" attached. Each "ornament" took 7 circle punches to complete. Calculate that & you come up with 525 circles!! And that's a LOT of punching! I spent almost a week of nights watching movies & making these garlands. I used all sorts of random colors & patterns of paper. I didn't really have a definite color theme---just a bright, happy, summer fun feeling. So this worked---& I could use all my scraps of paper too! My FAVORITE part of any party!!! *Ice cream themed stickers (Target). *Foam stickers (Target dollar section). *Plastic ice cream bowl/spoon (Dollar Tree). *Plastic ice cream cone charm (tinythingsarecute.com)--cording from Joanne's. I packaged them all up in white paper bags. (Found at Walmart in the party section with the plates/tablecloths, utensils/etc.) They reminded me of the freezer-style bags that some groceries stores have to put your ice cream in. I loved that! The bags were tied off with the handmade tags. I just took manila office supply tags, adhered a punched 2" circle, & used ice cream stickers from the Martha Stewart brand at Michael's craft store. Tied off with the adorable charms from tiny things are cute & colored string (which can then be worn as a necklace) it just looks adorable. The kids kept eyeing the goodie bags throughout the party & some even asked, "Who are those for?" One of the decorations that I think was my favorite touch, were these paper window valances I made from freezer paper. We used the next door church as our party space. I just cut the correct length to fit across the 4 windows, measured even stripes & used a small plate to create scallops. Then I spray painted every other stripe red--using cardboard to cover either side of my stripes. And it wasn't an even coat. Just mostly red. Doesn't have to be perfect. The hanging ice cream cones were a purchase from ziggosfifties.com. I love them! They were one of those "had to have" items. They store flat so I can use them again & again! I am bummed though, because I didn't get a lot of full-view party photos. The "fellowship hall" (kind of like a small banquet room) was a larger venue then I'm used to for my girls' parties. Usually it's a cozy home party. So I don't think the decorations had as big of an impact as they might have had in a smaller setting. It was just an interesting thing I noticed. I made up about 8 rhyming clues, sealed in red envelopes, & hidden, that led the kids all over the party room & outdoors. And so that's why I've climbed a tree." She was like a mini tarzan hanging from that tree. Crazy kid. Clues were hidden under a chair.....with the sundae toppings.....in the freezer.....in a tree.....near the hose.....behind a bench.....& stuffed in a plastic bag & weighted with rocks at the bottom of the pool! The treasure at the was a squirt guns for everyone! The party guests could play with these at the end of the party & also take 'em home. The kids came in to cool off & have some ice cream sundaes!!! The ice cream sundae bar was filled with: Chocolate & vanilla ice cream, mini marshmallows, crushed Butterfinger candy bars, crushed Oreo cookies, brownies, canned blueberries, m&m's, gummy worms, peanuts, teddy grahams, sprinkles, chocolate sauce, caramel sauce, whip cream & cherries. I also served ice cream cone cupcakes. It was my first time making them. It was a flop. (I accidentally bought angel food cake mix?!) So, by the time I figured out how to make them for reals, the batch was half of what I had planned. Want to know something funny? The kids weren't the least bit interested in these. WHAT?? Well, Zoey ate 2. Good girl! I also made a small, plain, square cake with the leftover cupcake batter. Next up? Piñata fun!! Here's the completed piñata. I used it as a decoration on the cake & punch table until the beating began. See the cherry? I made it 30 minutes before the party started. And I agree with what some of you said: A cherry would complete the look! I'm glad I added it. Then the outside water fun commenced! I think the bigger peoples had tons of fun too! I found this game at Walmart & we played a round of it outside. It's like hot potato, but with water balloons. This ball opens up & you stuff a water balloon inside. Set the timer & start passing it around. When the timer stops, the water balloon POPS! If you're stuck holding it, you get soaked!! The kids also played on the slip-n-slide, threw water balloons, played in our little pool, soaked each other with the hose. There were bouncy balls, sidewalk chalk, velcro paddleballs, scooters, etc for as much outdoor fun as they could handle. The party could not have been such smooth sailing without all the help I had! Wow. I was overwhelmed (& greatly pleased) with all the extra assistance my friends gave me. I loved giving orders! haha! But it made me realize that I am going to start recruiting more help when I have parties. I just get too scrambled sometimes & more hands means a less-frazzled me. After the party, the girls & I went on a spontaneous kayaking outing with some friends. We'd never been before. It was great fun & a wonderful end to our wonderful day!!!! Pazely's "real" birthday is the 30th--tomorrow! We plan on going for Round #2 with the leftover sundae supplies. And I might just have to attempt the ice cream cone cupcakes again. Now that I'm an expert & all. Fantastic! It looks like everyone had a wonderful time! We did the ice cream theme last year but you out did me! Wow - what a great party!! You are such a cool mom. The party looks fabulous! What fun! I LOVE the invitations, and the garland. What a great pinata-busting shot! This party looks like so much fun. I bet she had a wonderful time. Lucky girl. i'll say it again nik - u really are the best mum EVERRRRRR! and stopping off at a hotel just because - LOVE IT!!! Ah, you sound like a great mummy. I wished you lived near me! looked like an awesome party!!! I'm here now! And the party looked great! Amy Atlas has nothing on you. Loved everything about it. You are probably the best mom in the whole world.